SpaceX’s big new rocket has blasted off on its first test flight, carrying a red electric sports car aiming for an endless road trip past Mars. The Falcon Heavy rose from the same launch pad used by Nasa nearly 50 years ago to send men to the moon. 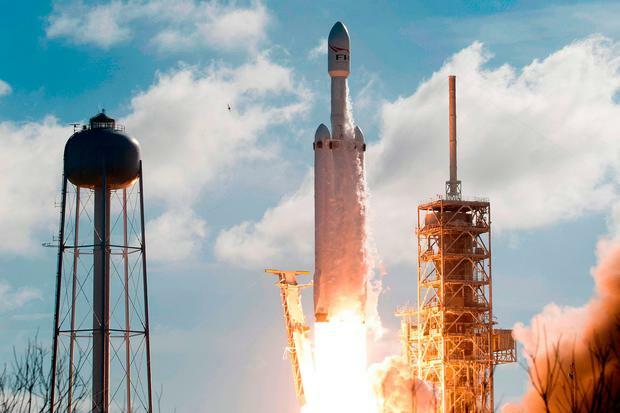 For SpaceX, the private rocket company run by Elon Musk, it was a mostly triumphant test of a new, larger rocket designed to hoist supersize satellites as well as equipment to the moon, Mars or other far-flung points. For the test flight, a red sports car made by another of Mr Musk’s companies, Tesla, was the unusual cargo, enclosed in protective covering for the launch. This still image taken from a SpaceX livestream video shows "Starman" sitting in SpaceX CEO Elon Musk's cherry red Tesla roadster after the Falcon Heavy rocket delivered it into orbit around the Earth on February 2, 2018. A red Tesla Roadster is seen during preparations to use it as a mock payload for the launch of a SpaceX Falcon Heavy rocket, in Cape Canaveral, Florida, U.S. December 6, 2017. Picture taken December 6, 2017. Flickr.com/photos/SpaceX via REUTERS. A red Tesla Roadster is seen during preparations to use it as a mock payload for the launch of a SpaceX Falcon Heavy rocket, in Cape Canaveral, Florida, U.S. December 6, 2017. Picture taken December 6, 2017. Millions more watched online, making it the second biggest livestream in YouTube history. A space-suited mannequin was at the wheel, named “Starman” after the David Bowie song. “It’s kind of silly and fun, but I think that silly and fun things are important,” said the SpaceX chief who also runs Tesla and is keen to colonise Mars. Two of the boosters — both recycled from previous launches — returned minutes after lift-off for on-the-mark touchdowns at Cape Canaveral. Sonic booms rumbled across the region with the vertical landings. Ballast for a rocket debut is usually concrete — “so boring”, he said in a post-launch news conference. The Roadster was anything but. 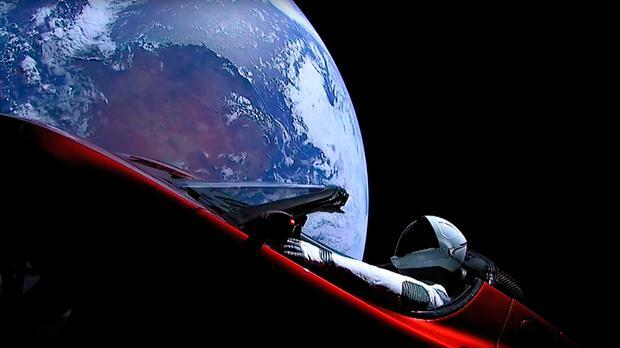 Cameras mounted on the car fed stunning video of “Starman” tooling around Earth, looking something like a racing driver out for a Sunday trip, with its right hand on the wheel and the left arm resting on the car’s door. A sign on the dashboard read “Don’t panic!”, and Bowie’s Life on Mars? played in the background at one point. A Hot Wheels roadster was also on the dash with a tiny spaceman on board.